What to do when your pet gets sick and the steps you can take to prevent illness. The link between pet diet and disease, and how the right diet can not only prevent disease but reverse it. Stunning facts about puppy and annual vaccines. How to understand the emotional and spiritual nature of your pet. The one question you should always ask when interviewing a new veterinarian. How to help heal your pet the natural way. How to identify and understand your pet’s disease — from A to Z. 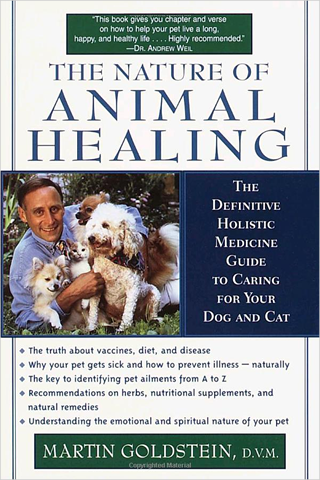 Since its release in 1999, my aim with this book has been more of an immediate one: to demonstrate the ways in which our pets are being ill served by us, by their environments, and, yes, by some aspects of conventional veterinary medicine. I hope to be, in effect, a voice for these pets, because they cannot talk. I want to show that with the right care, they can still lead healthy lives. And I intend to make clear that we are not the true healers of our pets; they are. The best we can do is to help them grow as strong as they can, both physically and emotionally, so that they can best tackle the hard work they must do to regain and maintain their own health. POSITIVE, COMPASSIONATE . . . VIVID AND ENGROSSING . . . This is a life-affirming book that should interest any pet owner. This is a book about animal care, but the guidelines of holistic and integrative veterinary medicine are, of course, based on those originally devised to help human beings. If we’re going to give animals purified water because we realize what a silent killer ordinary tap water can be, why not drink purified water ourselves? If good foods and dietary supplements boost our pets’ health, why not start applying the same nutritional lessons to improve our own? If acupuncture and homeopathic medicines work on animals, why not incorporate them into our own lives? Perhaps you saved your pet from being put to sleep at the shelter, and took them into your life, caring for them, and showering them with love? Now you can help them further by applying this book’s principles of holistic health and diet to their life. And you will also gain some valuable advice on improving your own health too.